After an enthralling four weeks, the curtain has fallen on the 2019 Perth Festival. As the Festival’s production partner, PAV Events provided technical support for The Writers Festival, Giselle, A Ghost in My Suitcase and Re-Member Me. Other PAV Festival highlights included Chevron Gardens where a mix of local legends and global acts moved crowds at Elizabeth Quay during the balmy nights of February and March. The Gardens stage hosted an impressive line-up including Aloe Blacc, Orbital, The Preatures, and the Melbourne Ska Orchestra. PAV Events brought the stage to life with a swag of lighting fixtures, projection and LED screens. The awe-inspiring Boorna Waanginy: The Trees Speak returned to Kings Park to celebrate our unique environment and indigenous culture over the Festival Opening Weekend. More than 200,000 people experienced this landmark Perth event over four spectacular nights. 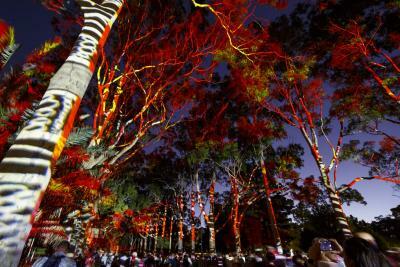 Using multiple high-powered projectors, PAV Events once again transformed the trees and avenues of Kings Park into an ever-moving canvas. Trees and flowers bloomed, vast flocks of birds descended, wetlands filled, bushfires raged and stories of the formation of Western Australia’s extraordinary and unique landscape unfurled above and around. Featuring the WA Symphony Orchestra, the wildly inventive Magic Flute left audiences spellbound with a kaleidoscope of projection that brought His Majesty’s theatre to life. Mozart’s glorious comedy directed by Barrie Kosky and British theatre group 1927 appeared for the first time in Australia.